The Oakland Raiders and Kansas City Chiefs, two rivals in the Western Division of the American Football League, met in Oakland on October 1, 1967 in a key early-season matchup of teams that had both started off at 2-0. The Raiders were coming off of an 8-5-1 record in 1966 and had taken steps in the offseason to try and move up. Acquired was QB Daryle Lamonica (pictured at right), a strong-armed backup in Buffalo who had shown great promise in limited action, plus star CB Willie Brown from Denver. 39-year-old QB/PK George Blanda had also been added, having been discarded by the Oilers, providing a veteran backup quarterback and dependable placekicker, and there was an outstanding rookie in guard Gene Upshaw. Added to the talent already on hand, Oakland, under the guidance of managing partner Al Davis and Head Coach John Rauch, had come out of the gate in impressive fashion by defeating the Broncos and Patriots by a combined score of 86-7. Kansas City, coached by Hank Stram, was the team that Oakland was seeking to displace. The Chiefs were the defending AFL Champions, losing to the NFL’s Green Bay Packers in the first Super Bowl. They had an excellent and experienced quarterback in Len Dawson, a dangerous receiver in flanker Otis Taylor, a productive running game led by HB Mike Garrett, and a good defense. There were 50,268 fans in attendance at the Oakland-Alameda County Coliseum. It was raining as the game started, although it eventually cleared. The first quarter was scoreless, but a clip on a punt return had the Chiefs starting inside their ten yard line late in the period and a pass by Len Dawson that was deflected was intercepted by SS Rodger Bird to give Oakland possession at the Kansas City 16. On the first play of the second quarter, Daryle Lamonica tossed a one-yard touchdown pass to HB Clem Daniels. George Blanda added the extra point and the Raiders were ahead by 7-0. The Chiefs had to punt following their next series and the Raiders, starting from their 37, drove to another score. Lamonica completed passes to split end Bill Miller for 12 yards, FB Hewritt Dixon for five, and TE Billy Cannon for 12 yards to the KC 23, but the next three tosses were incomplete and Blanda kicked a 31-yard field goal. Oakland got the ball right back when flanker Noland Smith fumbled at the end of a 35-yard kickoff return and the Raiders recovered at the Kansas City 34. A swing pass to Dixon picked up 17 yards but the home team came up empty when the drive stalled at the nine and Blanda’s 16-yard field goal attempt hit the goal post. Given a reprieve from falling deeper into a hole, the Chiefs advanced 80 yards in six plays. Mike Garrett (pictured at left) ran three straight times for 12 yards and Dawson then threw long to Otis Taylor for a pickup of 46 yards to the Oakland 22. Following another short run by Garrett, Dawson passed to HB Gene Thomas for a 20-yard TD. Rookie Jan Stenerud converted to narrow Oakland’s lead to 10-7, and that remained the score at halftime. 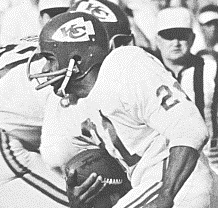 The Chiefs had the first possession in the third quarter, again starting deep in their own territory, and Dawson was hit by DE Ike Lassiter as he was throwing and LB Gus Otto intercepted to give the Raiders the ball at the Kansas City 23. That led to a Blanda field goal from 33 yards and a 13-7 advantage for the home team. Kansas City had to punt following a short series, once again from deep in Chiefs territory, and the resulting return by Bird for 11 yards plus a 15-yard face mask penalty put Oakland on the KC 35. The Raiders again couldn’t move on offense and this time Blanda was wide on a 42-yard field goal try. The teams exchanged punts once again, with the Raiders gaining the advantage in the battle for field position. Early in the fourth quarter Blanda was successful on a 42-yard field goal and Oakland opened up a 16-7 lead. Noland Smith returned the ensuing kickoff 48 yards to the KC 46 and the Chiefs came alive on offense. Garrett again ran effectively and finished the series off with an option pass to Taylor that resulted in a 17-yard touchdown. Stenerud’s extra point narrowed the margin to two points at 16-14. The Raiders responded with an 80-yard drive in ten plays. Lamonica threw to split end Warren Wells for 11 yards and HB Clem Daniels had a 12-yard run, but a penalty and sack backed them up and they were facing a third-and-44 situation. The Chiefs were flagged for a personal foul that gave the home team a first down and two plays later Lamonica connected with Cannon for a 29-yard TD. Blanda added the point after and it was a 23-14 score with a little over eight minutes to play. The Chiefs were far from finished and the diminutive Smith came through with another long kickoff return, this time going 54 yards to the Oakland 48. A short pass was followed by Garrett losing ground on a pitchout, but facing third-and-14, Dawson (pictured at right) completed a pass to split end Chris Burford for a 45-yard gain and Garrett ran for a six-yard touchdown on the next play. Stenerud converted to once again make it a two-point contest. The Raiders punted on their next series and Kansas City regained possession with the clock down to 2:08. Dawson threw to a wide-open Taylor on first down who dropped the ball, and after another incompletion and a sack, the Chiefs had to punt. They had one last shot in the final 33 seconds of the game, but time ran out for them on their own end of the field and Oakland held on for a 23-21 win. The Raiders had the edge in total yards (306 to 243) and first downs (16 to 12). The Chiefs recorded five sacks, to three for Oakland, but also turned the ball over three times while the Raiders suffered two turnovers. Daryle Lamonica completed 23 of 38 passes for 236 yards and two touchdowns with one interception. Clem Daniels rushed for 72 yards on 16 carries and also caught three passes for another 23 yards and a TD. Hewritt Dixon gained 28 yards on 13 rushing attempts but led the Raiders with 8 catches for 60 yards. For the Chiefs, Len Dawson was successful on 12 of 25 throws for 160 yards and a TD with one picked off. Mike Garrett gained 50 yards on 19 rushes that included a touchdown and also tossed a scoring pass. Otis Taylor had 5 catches for 79 yards and a TD. The win put the Raiders in a tie for first in the Western Division with San Diego, and while they lost the first game of the Eastern trip to the Jets, they didn’t lose again on the way to a 13-1 record. Oakland easily defeated Houston for the AFL Championship but came up short in the Super Bowl against the Packers. Kansas City lost the rematch between the teams and finished second in the division at 9-5. 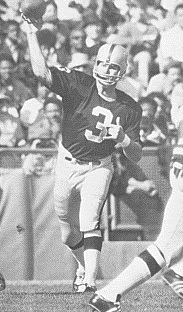 Daryle Lamonica had a MVP year for the Raiders as he topped the AFL in touchdown passes with 30 while throwing for 3228 yards. 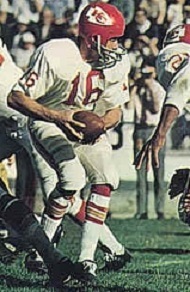 George Blanda led the league in scoring with 116 points and 57 extra points while placing second (behind Kansas City’s Jan Stenerud) with 20 field goals. 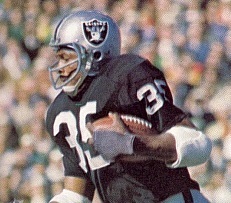 Just as he did against the Chiefs, Hewritt Dixon (pictured above) led the Raiders in pass receiving with 59. The converted tight end gained 563 yards as a receiver and 559 on the ground for a total of 1122 yards from scrimmage, which ranked seventh in the circuit.